Bert was born on 7 January 1888 in Greenham; he was the eldest son of Thomas Deacon and his wife Annie née Kealing. He had an older sister, Elizabeth (born 1884) and younger siblings, Eva Nellie (1890), Kate Maria (1 Sep 1892), Edith (1896), Philip (13 Aug 1899) and Mabel Annie (1905). In 1901 the family was living at Daisy Cottage, Greenham but moved to 2 Holly Bank (now 71), King’s Road in Newbury around 1894/5. on the island of Hoy. Thomas was considerably older than Annie, in 1911 he was recorded in the census, aged 60, at home with several of the children while Annie was a live-in housekeeper for Samuel Burridge and his family in Arlington Cottages, Newbury. It was unusual for a wife to be working away from home; perhaps Thomas was finding it difficult to find work as a labourer - suggesting that his health may have been failing? Three years later he died, aged 63. Bert opted for a radically different career path to that of his father, starting as a book stall assistant as soon as he left school he then went into domestic service as a footman. Whilst this may raise thoughts of Downton Abbey (filmed at nearby Highclere Castle), Bert was at the parental home in King’s Road for the 1911 census – an odd place for a footman. Of course he could have been given the night off if his employers were away for the weekend, or he could have been employed at a house where there was inadequate servants quarters to house the entire staff – or he could have been ‘between jobs’. When war broke out in 1914 Bert did not rush to sign up, waiting until 17 September 1915 to volunteer, not for the army, but for the senior service, the Royal Navy. His employment as a footman was evidently noted by those responsible for Navy postings, after a very short period of training in Portsmouth he was sent to serve as an Officer’s Steward Class II on HMS Zealandia. HMS Zealandia (formerly HMS New Zealand) was a pre-Dreadnought battleship, powerful but out-dated, nevertheless an important part of the Grand Fleet based at Rossyth in Scotland. Soon after Bert joined her the Zealandia was sent to the Mediterranean to support the Dardanelles campaign returning in February 1916 after the withdrawal from the Gallipoli peninsular. HMS Zealandia rejoined the Grand Fleet on 16 March 1916 and was then transferred to the Nore command in May. On 26 July Bert was promoted to Officer’s Steward Class I. In December 1916 the Zealandia went to Chatham Dockyard for a long refit, halfway through which Bert’s services were deemed unnecessary. He was returned to Portsmouth in April 1917 for reassignment. He did not get another ship until October (no doubt an officer’s mess in Portsmouth found him useful). 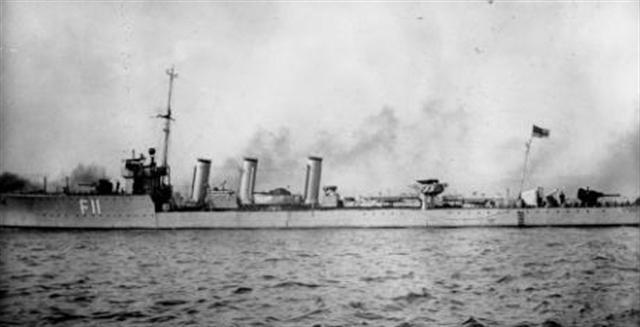 His new ship was HMS Narborough, a modern (launched 1916) M Class destroyer that formed part of the 12th Destroyer Flotilla based at Scapa Flow. In early January 1918 the Narborough and a sister ship, HMS Opal, were at sea escorting the light cruiser HMS Boadicea on a patrol against German mine layers when a severe snowstorm forced them to abandon the patrol and return to Scapa Flow. On the return journey at night on 12 January 1918, in appalling visibility, the Opal struck rocks off South Ronaldsay, the Narborough, following the Opal, struck 80 yards away. Both destroyers were lost with only one survivor (Able Seaman William Sisson from HMS Opal), in all 188 men lost their lives, some drowned, others died of exposure after making it to the cliffs (Sisson was found alive on the cliff 36 hours after the wreck). 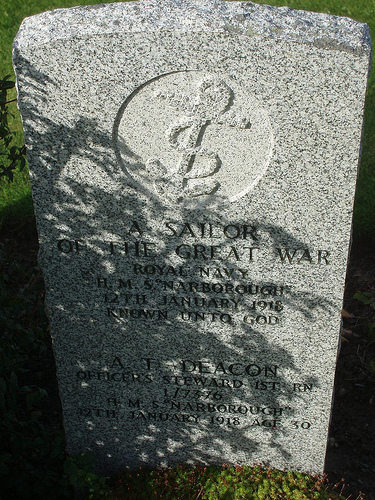 DEACON – Jan 12, Albert (Bert), eldest and dearly loved son of Mrs Deacon, 2, Hollybank Terrace, King’s-road, lost his life on the “Narborough,” off the coast of Scotland, when returning to base, the ship becoming a total wreck through a terrific gale and snowstorm. Lord we love him, let him stay. From his sorrowing Mother, Sisters and Brother. Bert’s body was one of the few recovered and buried in grave B.164A at Lyness Naval Cemetery, which he shares with an unidentified shipmate. Overlooking the bay where the tragedy occurred is a memorial to the 188 men lost from the Opal and Narborough. 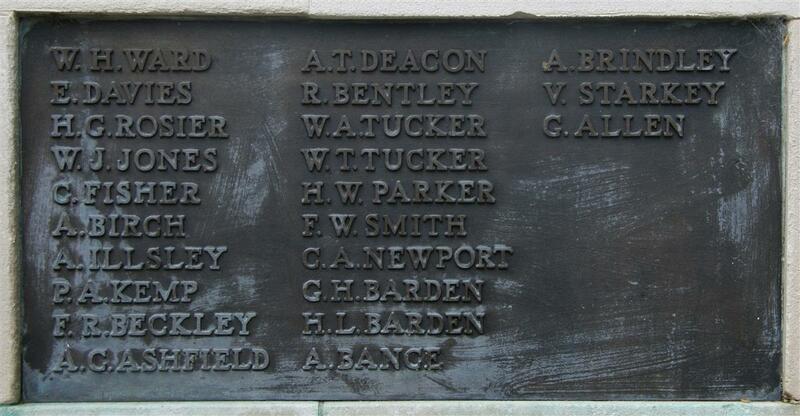 Locally he is remembered on Tablet 6 of the Newbury Town War Memorial and the parish memorial board and roll of honour in St Nicolas Church, Newbury. DEACON - In loving memory of Albert (Bert) Deacon, of 2, Holly Bank, King's-road, aged 30, first class steward on HMS "Marlborough," who was drowned January 12, 1918, during a terrific gale and snowstorm in the North Sea. Thy presence still is always near. - From his loving mother, brother and sisters. Thanks to Karen Newbury for her help researching this sailor.